The Best Youtube Marketing Tool! TubeAssistPro is a YouTube marketing tools that helps to boost the reach of your videos to those that are interested in seeing them. Alongside this, it will help you to grow your channel subscriptions list. You can also easily get targeted visitors to your site from youtube, and best of all - it's all automated!Once you run TubeAssistPro, it will increase your channel subscription， video views and targeted traffic in 7*24*365 full automatically. Traffic From Live Videos.TubeAssistPro allows you to search and real-time watch youtube live videos base on the keywords you set, then it can leave your message or comment there, you will get instant traffic using this function. And by using the powerful videos filter features, you will always find the targeted people and drive them to your videos or pages.Search Live Live Chat Running Search Live Running Live Chat1 Running Live Chat2 Proxy and Account SecurityBind Proxy and Avoid Account SuspendedThis function lets you bind accounts with appointed proxies, so that later the program will use the same proxy with this account all the time. This will make your account much safer. These sites don't want to see that you are in USA now and then you are in England after 1 min. You can set every account to use a different proxy, you also can set every 2 or X accounts to use the same proxy. 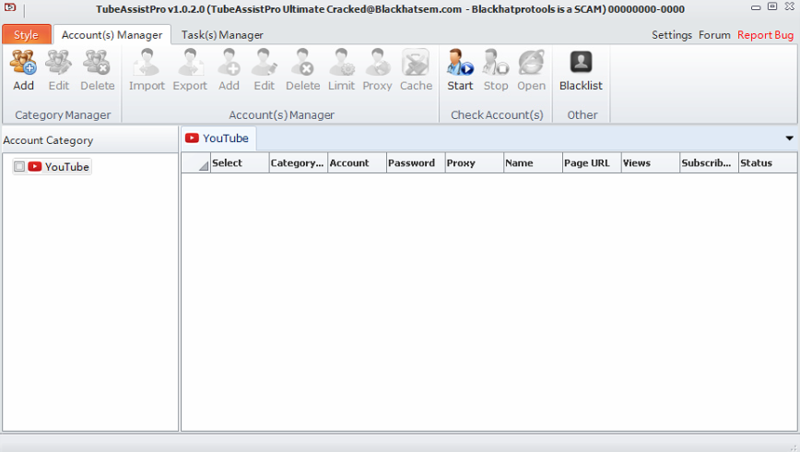 The program can also use the conventional proxy rotate method of using a different proxy every time the account logs in. It's very smart, it's all is down to your settings.And TubeAssistPro's operation is same to human's operation, this will avoid your accounts got suspended.